Distance Education Theory research papers discuss the academic opportunities that students obtain in distance learning. Distance Education Theory are one of the many research paper topics that Paper Masters provides. Use this topic suggestion as a guide on how to write a paper or order your own custom research paper. Distance education provides students academic opportunities they might otherwise be unable to obtain within a local, standard classroom. Educational theorists grapple with the goals, unique advantages and disadvantages of distance education. While long distance correspondence courses have existed for generations, distance education theory is a relatively new field of scholarship triggered by recent advances in telecommunications technology enabling the mass delivery of education through online courses. The three contemporary founders of distance education theory are Otto Peters, Borje Holmberg and Michael G. Moore. During the 1960's, Otto Peters proposed an industrialization theory to explain the proliferation of distance education options. Roughly twenty years later, Holmberg proposed the theory of didactic interaction to describe the differences between synchronous and asynchronous. Moore then proposed a relationship between teacher-student interactions and structures. He argued that a greater quantity and quality of interaction enabled students and teachers to overcome structural barriers such as space and time. Working adults often engage in distance education due to its convenience. Therefore, theories related to the specific instruction of adults, rather than children, are also relevant to distance education theory. For example, Knowles' theory of andragogy as an alternative to the traditional pedagogy may be used to explain the focus upon individualization and autonomy found within distance education theory. Educational Program on the Internet - Educational Program on the Internet Research Paper looks at a sample of how to order graduate level services, with specific instructions to what needs to be included. Technology in Education - Technology in Education research papers report that teaching and learning are being redefined as a result of technology in the classroom. Discussion Thread - Research papers on a discussion thread explain the fuction of the online tool used by professors and student to discuss specific topics in class. Journal of Educational Psychology - Journal of Educational Psychology research papers discuss the psychological connection and educational growth that future educaters need to understand. Instructional technology research shows that throughout the 20th Century, many changes have impacted the way that learning is facilitated within the educational system. Virtual Learning Environment - Virtual Learning Environment research papers discuss the web-based system for enhancing the educational experience through the integration of computer-based and virtual activities. Qualitative Inquiry in Education - Qualitative Inquiry in Education Research Papers look at an order placed for an article critique on an education topic of distance learning or internet learning activities in a classroom setting. Post Blackboard - Research papers on post blackboards discuss how today's classrooms have utilized the online technology for distance learning and online classes. Qualitative Research Methods - Qualitative Research Methods research papers on the research employed in academic disciplines that seek to understand an aspect of human behavior. Teaching with Technology - Technology is an important aspect of teaching and learning in today's classrooms. A John Dewey's Influence on American Education - Related Research Paper Topics. 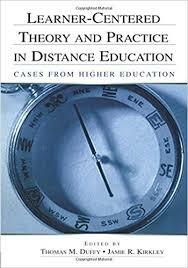 Distance Education Theory research papers discuss the academic opportunities that students obtain in distance learning. Paper Masters writes custom research papers on Distance Education Theory and discuss the academic opportunities that students obtain in distance learning.